The How-To Gal: Opinions Please! Fellow Beautifiers I need your help! I purchased this chair a couple of months ago, isn't she a beaut?? I love the shape, the cute little legs poking out from underneath and the tufting in the back. Can you believe that it even rocks! Awesome! I am currently taking her apart into pieces, burning the hideous fabric she is wearing now and documenting each step to share with all of you! Fabric picking time is inching in...and I'm having trouble finding the perfect print for reupholstering. I want something bold, but not overbearing (as my dad would say). Here are a couple of swatches I like, but I would love your opinions and suggestions! I don't have a specific color pallet in mind, so any suggestion help! Where do you find great (cheaper is better) upholstery fabric? I absolutely love the orange flower fabric. I get a lot of material at JoAnn's. 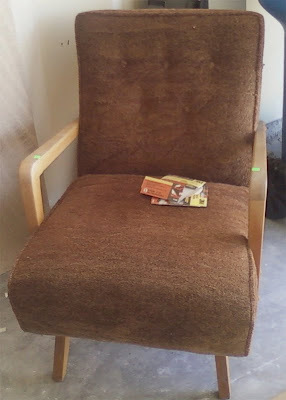 Just redid a wingback with fabric from there. It's bold and totally different than anything I have done before. I like the top right hand corner one - the fabric on the chair actually though. What room is the chair going in? Does it need to match anything? I love the first flower pattern, i think it would really bring out the lines in the chair! :) I <3 your blog! I know it's the boldest but I love the duck egg and black geometric pattern. I just think it would go really well with the shape of the chair. If you wanted to tone it down later you could always throw a plain coloured wool blanket over one arm, that would add texture too. I'd love to be able to upholster, all I've ever done is the seats of dining chairs. The is an upholstery and drapery place in Blackduck, MN. A town so small that if you blink you will miss it. And in this store they sell all of the "scrap" fabric that is left over after a project. From very small scraps to very large chunks!!! For awesomely cheap prices! I love the orange floral one as well! I've found upholstery fabric for cheap at home fabrics in Orem and Sandy. The only problem is, they don't have too many contemporary prints. When you find out about a place with upholstery fabric as cute as those PLEASE let us know! I like the geometric pattern the best. The blue and brown geometric pattern. The orange flower just popped out for me! I thin the orange and yellow flowered one is the best. Hollywood or Sofia Orange - both would be beautiful!! Orange flower fabric for sure. I have a coupon for 40 percent off fabric and JoAnn's if you want it. I will give it to you tonight. Orange flower! It's playful, just like the chair. BTW- Just discovered your site... Love it!!! Thank you everyone for all of the good suggestions! Once I have the finished product, I will be sure to post the tutorial! !